A architectural drawing of the new store front for Pushin's in Bowling Green, Ky. A architectural drawing of the new store front for Pushin's in Bowling Green, Ky. Created by J.M.Ingram. 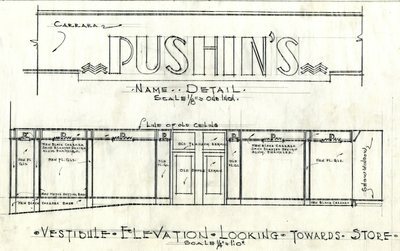 Architectural drawings of a remodeled storefront for Pushins Department Store, Bowling Green, Kentucky. Plans show elevations on both College Street and Main Street, including plate glass windows, monogram detail, and details of show windows. 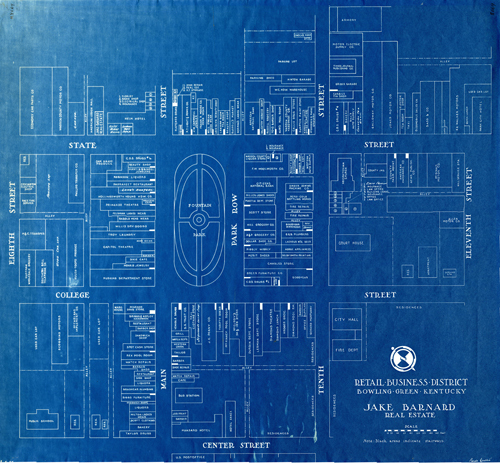 Also included are what appear to be blueprints from an earlier design of the storefront in 1920. These are not by Ingram, but initialed "J. H., Jr."
"Pushin" "Bowling Green" "Drawing" "JMIngram"